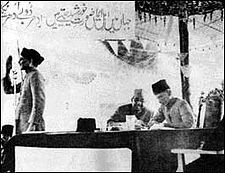 "As from the fifteenth day of August, nineteen hundred and forty-seven, two independent Dominions shall be set up in India, to be known respectively as India and Pakistan." "August 15 is the birthday of the independent and sovereign state of Pakistan. It marks the fulfilment of the destiny of the Muslim nation which made great sacrifices in the past few years to have its homeland." ↑ Sanain. 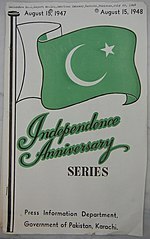 "Independence Day Of Pakistan: Its History and Celebrations". Allvoices. Retrieved 13 August 2012.